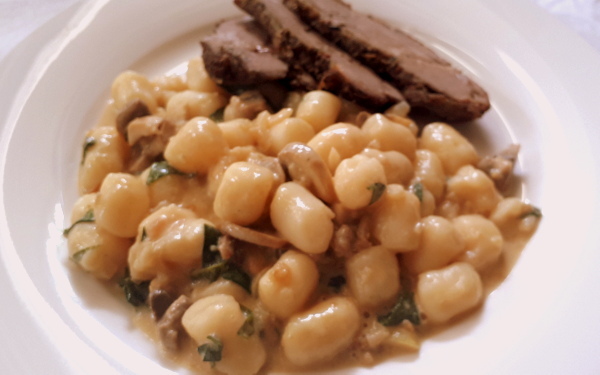 Lamb roast is a classic main and our Bacci’s Fresh Baby Gnocchi in a creamy spinach & mushroom sauce will complement it deliciously! – Also perfect as a vegetarian main meal. Cook 1 packet of Bacci’s Fresh Baby Gnocchi as per packet instructions. Meanwhile, warm up the creamy mushroom sauce in a deep fry pan – we added a cup of chopped fresh spinach leaves too. Let them wilt in the warming sauce. Add gnocchi straight to the pan once they start floating on top, stir and serve. Fry a variety of different mushrooms to garnish your dish and add even more texture! Always our gnocchi straight to the sauce, the splashes of cooking water will add a silky shine to your sauce.